Oftentimes we need to stay in touch with our family or our colleagues. This holds especially true for destinations that are faraway from our homes. As part of the system, Vietnam offers free or inexpensive medical care for everyone. Unfortunately medical facilities are often inadequate. Every town has a medical clinic but very little have the financial basis to invest in modern medicine or necessary supplies. This is where traditional healing steps in. 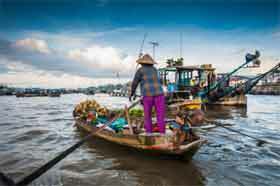 Over the years the Vietnamese people have found ways to cure some diseases by themselves. If one is suffering from pain, the person rubs a coin with a hot ointment on it to the hurting part of the body. Or if someone is suffering from a stomach ache, some hair must be pulled out or the spine must be pinched. Suffering from acne: Marinate silk worms in alcohol, burn them until nothing but ashes are left. Add some water and drink the mixture. The Vietnamese natural healing has a cure for almost everything like pains, nausea, colds and headaches. Vietnamese people believe that one's health is a necessity which includes physical, spiritual, social and emotional factors. Natural healing has a very long history in Vietnam. Over the years many of the exotic ingredients are no longer used but the diagnosis treatments are similar and have not changed much. It is based on two natural elements: The "Duong" (the male principle) and the "Am" (the female principle). If both elements are well-balanced the result will affect in good health. The "Duong" is located in the abdomen and controls the gall bladder, spleen, small and large intestines, bladder and left kidney. The "Am" is located in the brain and spinal cord and controls the heart, liver, lungs, stomach and right kidney. Many people from all over the world are looking into the natural healing methods from Vietnam. If the western medicine does not cure some people, they try this treatment which very often works for them. There is an increase of interest using traditional medicine for chronic illnesses, such as cancer and aids. Vietnamese people with these diseases seem to live longer than people from the western part of the world. Traditional treatments are safe. It also has therapeutic benefits in calming down people and getting their confidence back. That is because the methods used in natural healing have a long history in the Vietnamese culture.